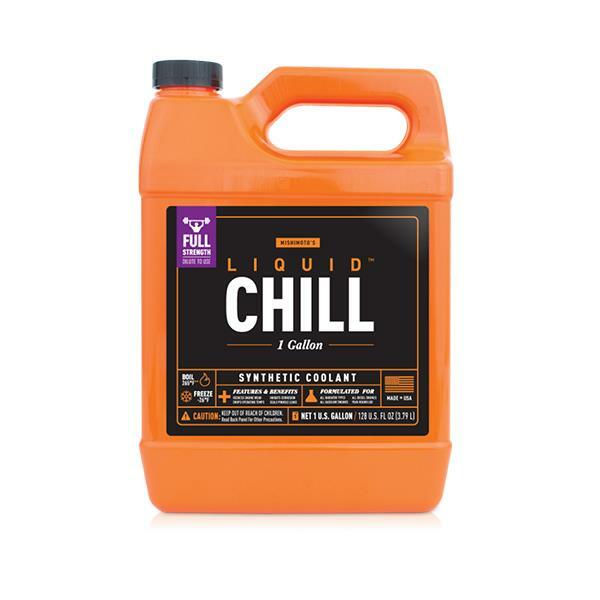 Mishimoto Liquid Chill Coolant Addative UNIVERSAL - Dezod Motorsports Inc - Home of the automotive performance enthusiast since 2002. Do you hear that? That little sigh that’s coming from your engine bay? That’s your radiator asking for Mishimoto Liquid Chill® Synthetic Engine Coolant / Antifreeze. Formulated to operate flawlessly under extreme conditions and with both gasoline and diesel, Liquid Chill® antifreeze and engine coolant will help your engine warm up quickly and maintain ideal operating temperatures. The proprietary formula doesn’t contain any nasty nitrates, amines, high-fructose corn syrup, phosphates, silicates, borates, and all those other “ates” that will clog up thermostats and radiators, and cause excessive wear on water pumps. However, Mishimoto engineers strongly recommend that you and your children do NOT consume this antifreeze coolant. Seriously, don’t drink it, and keep it on a high shelf so kids and pets can’t get to it.